Some of the best tasting honey you will ever have comes straight from the backyard of a local beekeeper. Once you buy honey this way, it is very hard to go back to buying it from a store. It is 100% honey 100% of the time. Pure, raw, all natural, unfiltered, and delicious as can be. Unlike a lot of the honey sold in stores, which has a rubbery, muted, blah taste; our honey retains its full rich flavor and all of the health benefits. This is because our honey is minimally processed. We do not use chemicals for treating the bees for disease but use natural means. We do not pasteurize our honey or put it through a high pressured filter which takes out the minute traces of pollen, beeswax, and other yummy goodness. We have our customers tell us all the time, that it is the best honey they have every tasted! Our honey bee farm is situated in Fayetteville, GA on two acres, surrounded by lots of wood, marshland, and pasture. Normally, we have anywhere from 10-50 hives that we operate depending on the time of year. Honey produced at our farm in Fayetteville is wildflower honey. In addition, we move our hives to North GA in the Blue Ridge Mountains where the bees make sourwood honey. Wild, or feral, honey is a honey lover's dream. Imagine going into the woods, finding a wild honey bees nest, sticking your hand in, and pulling out an unadulterated chunk of dripping honey comb. That is essentially what you will be getting with our wild honey. Not touched by man. No pesticides used, no mite treatments used in the hive, no plastic foundation, no wood glue, no treated wood used as hive material. 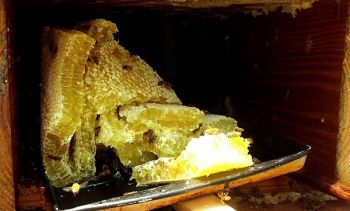 The bees have produced the honey with no beekeeper watching after them and can do outstandingly well just on their own. Here at Southeast Bee Removal, we are amazed how we can spend lots of time taking care of hives in our own backyard only to have a wild hive outperform it in strength and honey production with no help from man. Very similar to our backyard honey except even more raw and in its natural state. The comb is carefully removed at the job site and transported in food grad buckets. Then it is simply crushed and lightly strained to remove bee parts and large bits of beeswax. The flavor and taste is incredible. The wild honey contains more pollen and beeswax particles and tends to crystallize faster. The crystallization process is normal. Some people prefer it this way as it is a sign that is very pure and natural. Honey from the store has been heated to high temps and strongly filtered to keep the crystallization process from happening. Crystallized honey is easy to spread and great in smoothies, tea, granola, and cooking. It may be warmed slightly, up to 110 degrees, and will return to its liquid state. 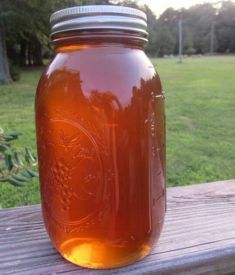 Both liquid honey and crystallized honey can keep indefinitely and is best stored at room temperature. 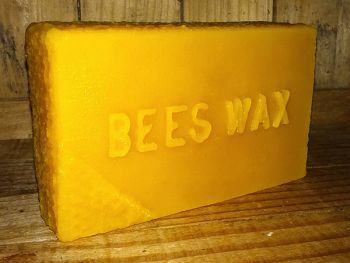 Our 100% pure beeswax chunks have many uses, some of which are candle making, soaps, lip balms, and cosmetics. The color of beeswax ranges from light to dark yellow to a light brown color. When rendering wax from wild beehives the wax tends to be darker and browner than the beeswax from our backyard hives. We sell filtered beeswax in one pound blocks as well as by the ounce. Candles made from 100% beeswax are superior to other candles. The smell is delightful, having a slight sweet smell of honey when burned. 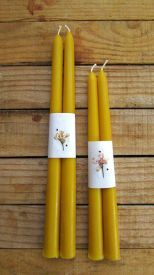 Beeswax candles burn very clean and without the black soot of paraffin candles. They burn longer than regular candles and also clean the air. Tapered candles are great for when you only want to burn a candle for a few minutes up to a few hours. Our tapered candles burn at a rate of approximately one inch per hour. Jar candles should be burned for several hours at a time so that the wax is burned to the edges to avoid tunneling. Wicks should be trimmed regularly. NEVER LEAVE A BURNING CANDLE UNATTENDED. We harvest our pollen with traps set underneath the hive. The traps have small holes that the worker bees must pass through when returning to the hive. As they go through the holes, the pollen granules are knocked off their legs into a tray. We harvest fresh pollen almost every day in the spring. A strong bee hive can fill a single pollen trap with a quart of pollen in a day or two. Though the pollen is usually fairly clean, we will pick out or blow out with a fan any debris. Once harvested, the pollen is stored in the freezer. Fresh pollen can be stored in the refrigerator (15-30 days) or freezer (months) to prevent it from molding. The pollen is usually a mix of light orange, yellow, green, and brown granules. Occasionally there are some red granules. It all depends on what plants and flowers the bees are gathering from. Taste can vary as well, but a lot of what we gather has a mild sweet nutty flavor to it. 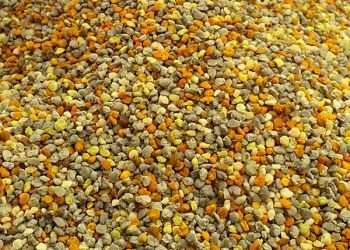 Taking bee pollen granules has many health benefits. Taking up to 2 tablespoons a day can be great for overall health and increased energy. Athletes have taken bee pollen for better performance. If you have any known allergies start slow, taking only one to two granules a day and building up. Taking bee pollen, like honey, can help reduce allergies and for best results, should be taken several months before the pollen season starts. Just as with other bee products, propolis is known to have great health benefits. Propolis boosts the immune system and is antifungal and antibacterial. It can be taken as a supplement and is also used in cosmetics. 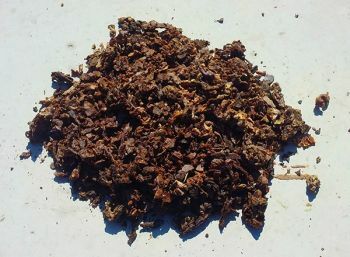 We have just begun collecting propolis and should have some available soon.